We are very pleased to offer our patients the benefits of Same Day Implant Smiles. Traditionally, patients would have their implant(s) placed, and then have to wait for 3-4 months of healing (bone integration) before we were able to permanently attach restorations to them. During this healing period, patients had to wear some kind of removable device to cover up the missing tooth or teeth areas. Now, thanks to advancements in implant designs and surgical techniques, when conditions allow, our patients can get screwed-in restorations during the same appointment as the implant placement - All In One Day! 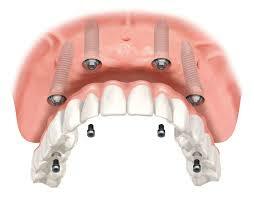 Implants are one of dentistry's greatest advancements, with the look, feel and function of natural teeth. Implants will preserve bone normally lost beneath dentures, become a permanent part of your mouth, and will not slip, move or irritate soft gum tissue. Who is a good candidate for Same Day Smiles?